When this originally came out (and I'm referring to my first experience with the game, i.e. the 2013 remastered edition, not the original 2006 one) I had to double-take. Not because it was an old school point 'n' click adventure game - I've played plenty of those, even one published by Wadjet Eye Games called Resonance. 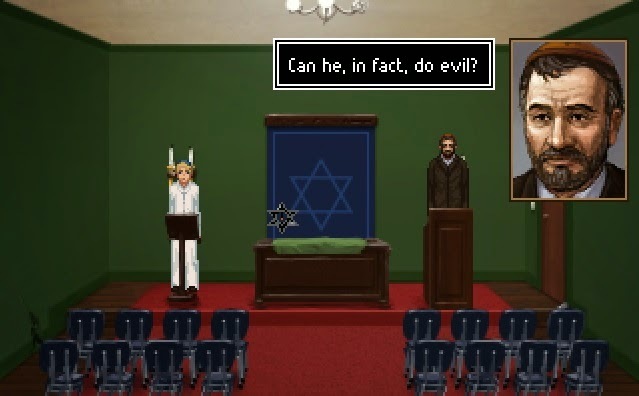 What got me that the game's protagonist was a rabbi. I can't say I've ever played a game where you control a rabbi and since I actually don't know much about Jewish culture I thought it'd be worth a look. I did however wait until it was 50% off so I got it for a measly $2.50 off Good Old Games. In "The Shivah", you play the role of a disgruntled rabbi called Russell Stone. His synagogue has seen better days with almost nobody attending his services. It's unclear of when he started to become cynical and lose faith but by the time the game starts, Rabbi Stone is ready to throw in the towel. He's almost broke and only a miracle could save him and his synagogue now. This is when he receives a visit from a detective investigating the murder of a former follower of his synagogue. Apparently the man left a sizeable amount of money in his will for Rabbi Stone which surprises him as he hardly knew the man. 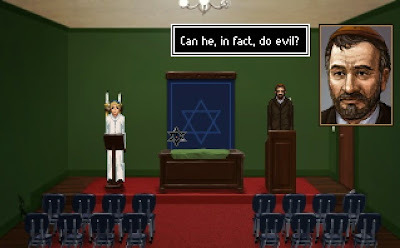 The game follows Rabbi Stone's investigation as he determines who the man was and why he left so much money in his will. I really enjoyed the plot as it touched some interesting themes such as existentialism, faith (or lack thereof), causality, and what it actually means to be a Jew (did you know there's actually a lengthy article on Wikipedia called "Who is a jew?"). It's definitely the game's strength and probably why it won an AGS Award for Best Dialogue writing (AGS stands for Adventure Game Studio, the engine that many retro point 'n' click adventure games are developed with). What words you use actually become important during a couple of crucial moments in the game where combat becomes very similar to insult swordfighting from the Monkey Island series. Without giving too much away, I was actually a bit mislead when I saw a couple of reviews commenting the Monkey Island swordfighting mechanic was in the game, so be warned: It's similar but not the same (SAME SAME BUT DIFFERENT!). In terms of difficulty, the game was reasonably straightforward, so it's probably easy for adventure game veterans except for the final scene of the game which took me several retries until I got it right. It's also annoying you can't save during this last part meaning if you retry the sequence, you'll probably be clicking like crazy to skip already read dialogue. Voice acting in the game is really good. There aren't any A-grade Hollywood actors involved but it's very high quality considering it's an indie game. While the quality of the voice acting was good the quality of the sound samples themselves though weren't Occasionally there was some crackling of the audio especially when shouting was involved. The soundtrack is another aspect of the game that was remastered in the 2013 version and I must say that I'm a fan. It's definitely got a jazzy, noir feel to it and I like how they even try to incorporate some Jewish sounding clarinets to it, the music for Stone's Office being a particularly good example. For those who love the latest in cutting-edge graphics, I can guarantee you're going to be disappointed. The game has a 640x480 resolution meaning the game is really pixellated and looks like an early 90s Lucasarts or Sierra adventure game. However, for adventure gaming veterans such as myself, this isn't really an issue and in fact amplifies its retro feel. The funny thing is, the 2013 version actually has much better graphics than the original - at least with respect to backgrounds and portraits. The game's only major fallback is that it's short: 1.5 hours short. There are some achievements that you might want to get that will encourage a replay or two, and there's even multiple endings (although they're not too different from each other) but in the end, you'll still only play the game for a few hours at most. The game is pretty well polished and I didn't encounter any serious bugs - but you'd expect that from what is a pretty short game. If you're uncertain about paying a few dollars for this game, you could always try the demo... wait, there's a demo? For a 1.5 hour game? But seriously, this is a game with a mature plot that touches existentialism, losing faith and what it means to be a Jew. Even though the game is short and a bit rough around the edges (even with the remastered edition) I think it's worth the few dollars Dave Gilbert is asking for. 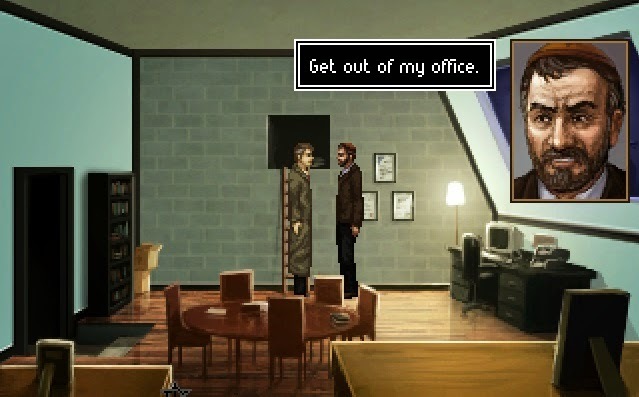 Also, what's with point 'n' click adventure game designers sharing the surname "Gilbert"? If you want to get the game, you can get it on Steam, GOG or directly from their website.